As it's Valentine's Day this weekend, I thought this week, I would do a week of Valentine's Day posts! 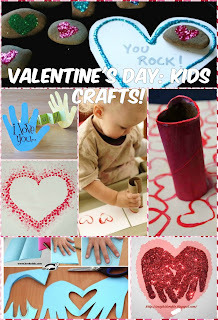 Today's is going to be DIY Valentine's Crafts! Now I love to craft, I find it super relaxing but this are also super easy and would be a great activity to do with toddlers and young children; I think I might have to try some of these with my niece, Bop, and I will definitely remember them for when I have children...one day! I'm sure most people have a toilet roll lying somewhere around there house and then all you need is some paint. You fold the toilet paper on one side to make a heart shape and then just let the kids go ahead and have fun stamping away. You can simple use paper or make a card or even decorate a t-shirt with fabric paint! One of the sweetest memories to have and look back on is handprints of children which you can compare the size difference as they grow. This is a very simple craft to do just that! Either draw around the hand and then paint with glue and glue to hand and print. Then sprinkle on glitter to make it look super adorable! Another way to remember hands is this easy and fast craft! Fold one sheet of A4 in two, place your hand near the fold, so to get a half-hearted between thumb and forefinger. Outline the hand and then cut around the line, being careful not cut through thumb and forefinger. You could be general like chocolate, what movie ect. Find some rocks from outside and give them a good wash. Once dry, let yourselves go wild with decorating. You can either use paint or be more delicate with glue and glitter to create a heart, keeping with the Valentine theme. 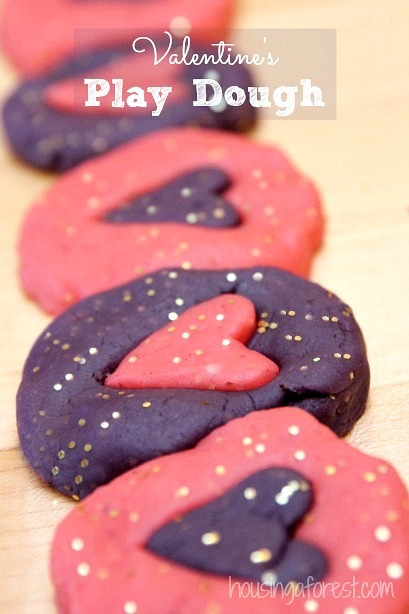 Click on the link to get this homemade recipe for playdough. I love that it's safe for kids, smells great and it's sparkly! You could even give these out as gifts to people if you wrap them up in little clear bags. I think this is another super cute kids project where they can go crazy with stamps. First cut out a heart template and attach it to the paper using BluTac. Using a pencil, with a new rubber on the end, the kids can get dipping in paint and start going around the outline. The website where this idea is from actually does this using fabric paint on a bag which is also super cute but maybe save that for the slightly more mature crafter how isn't going to make a mess. I think these would be super cute on paper for the children. Hope these gave you a few ideas to do with your children on Valentine's Day! Love!